Zoetis AQHA Ranching Heritage Challenge. During the fall, Matt Koch was able to ride Smart By Starlight outside on cattle. Let’s say you have a nice prospect for a Zoetis AQHA Ranching Heritage Challenge. 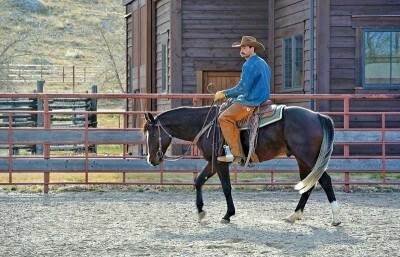 He was bred by an AQHA Ranching Heritage Breeder and he’s a nice, athletic horse, 3 coming 4. And let’s say you want to get that horse ready for the 2015 challenges and earn your share of the estimated $100,000 payout. How do you prepare your colt? The Journal went to the experts to find out, and for the next year, we’ll be following along as horse trainers prepare ranch-bred 3-year-olds for the 2015 competitions. Our two trainers are Matt Koch of Wagonhound Land & Livestock in Douglas, Wyoming, and Chance O’Neal of the Four Sixes Ranch in Guthrie, Texas. The two ranches have different foaling dates and different work schedules, and both horse trainers are experienced in Ranching Heritage Challenge competition. They’ve agreed to open up about their training timetables and how they prepare their horses for the big dance. While Matt is prepping several horses for 2015, he has his eye on one horse in particular that he’ll be featuring: Smart By Starlight, a 2011 bay stallion by WR This Cats Smart and out of HR Smiling Light by Grays Starlight. “Smirk” was bred and is owned by the Wagonhound. Chance has three horses that he thinks might make the cut: Turbo Transition, a 2011 sorrel mare by Mr Playinstylish and out of Turbo Chick by Shot O’ Gin; Paddys Ginnin Lady, a 2011 bay mare by Paddys Irish Whiskey and out of Valliant Gin by Tanquery Gin; and Paddys Wimpy, a 2011 buckskin stallion by Paddys Irish Whiskey and out of Wimpys Six by Wimpys Little Step. The three prospects were all bred and are owned by the Four Sixes, which is also a Zoetis AQHA Best Remuda winner. The Journal spoke January 14 with Matt and January 22 with Chance. I picked him as a prospect because he’s got some size to him: big bones and real proportional. He’s got a lot of cow and a lot of grit to him. He’s a really good ranch horse, but he’s extremely talented, also. I like a horse who has enough bone to go do a day’s work if you need to use him, but then he should also be built so he can move around and be handy enough. He has a good foundation. He can run and stop a little bit and turn around. We’ve tracked some cattle on him in break-away. I’ve doctored a few cattle outside on him. We’ve been working out of the herd. Since we had him going pretty good last year, I branded a few calves on him, and this summer, I used him to move yearlings outside. In the fall, I used him to doctor a few, and then when we preg-checked cattle, I’d take him with me and when we got done preg-checking, we had all those cows around, so I’d work him on a cow. This time of year, because of the weather, we have to work indoors, and he’s getting about 30 minutes of work a day. We try to re-enact ranch work inside as much as we can. We’re cutting on him some and I’m roping the roping dummy on him occasionally. We might kick a roping steer into the arena and just track it around or head it. I’m just trying to keep him as fresh as I can by doing other things on him. We’re hoping to get him ready for the (National Reined Cow Horse Association) Snaffle Bit (Futurity in September). Right now, he’s pretty good in his circles. He struggles a little bit in his lead changes still. We haven’t pushed it too much. We’re trying to get him as broke as we can. He’s got a good turnaround and really wants to stop. We’re on our way, anyway.